Buying a home is one of the biggest financial decisions most people will face in their lifetime. And just because you can buy a home does not mean that you are ready to buy a home. Many factors should be evaluated when determining if you are ready to buy a house. Below we review the thought process every new homeowner should consider before they make the commitment and investment into real estate. The first element to examine is your financial picture. For income, a mortgage lender will evaluate not only the amount of money that you earn but also the stability and likelihood of continuance for that income. For instance, a lot of self-employed borrowers have difficulty qualifying because of claimed tax write-offs on their tax returns. Part-time jobs, bonus and commissions can’t always be used. And certainly, income that you don’t claim on your taxes (cash-paying jobs) can’t be used at all. If you have full-time employment or income sources that are likely to continue (social security, pensions, etc.) then you’re likely in good shape. Your credit score and history will be evaluated as well. Make sure that you have high enough mortgage credit scores and a good payment history to make sure you are ready to buy a house. If your credit needs some work most lenders can provide guidance on how to improve it. The credit report that a lender obtains will also provide a current monthly debt obligation amount. That debt amount combined with the proposed mortgage payment will determine how much of a mortgage you can qualify for based on your income. If you carry too much monthly debt expenses then it may be difficult to buy a home, so reducing or limiting your monthly debt payments (auto loans, credit cards, personal/installment loans and student loans) is always important. The lender will also take an inventory on your assets to show your ability to save money and to show that you have reserves to help carry your payments if something disrupted your income. Did You Know? Cash cannot be used as reserves or for the down payment, so if you have some money hidden away you need to get it deposited into an account that can be sourced. This needs to be done at least 60 days prior to buying a home. Are You Ready to Have the Cash? How much down payment you have will also help determine if you are ready to buy a house. A down payment is the amount of money a home buyer has available that they can use to put down on the home. VA and USDA home loans do not require a down payment, but all other loan products do. An FHA loan for example requires a 3.5% down payment. For a $200,000 home you will be required to put down $7,000. So, you will want to consult your lender to see which program is right for you and see if you are comfortable with the down payment amount needed to decide if you are ready to buy a house. Can you afford the payment is the next obstacle to tackle when determining if you are ready to buy a house. Just because you can qualify for a payment does not mean that you are comfortable making the payment. A mortgage loan does not account for groceries, gas, car insurance, etc. when qualifying you. You are the only person that can determine if you are comfortable making a certain payment. Be wary of using online mortgage calculators when determining if you can afford a home. Most of these do not account for taxes, insurance, utilities and HOA. Our team however has created one of the best step-by-step mortgage payment calculators online, so be sure to use it to try and ballpark what your payment will be. Ultimately, even after using the calculator it is best to spend time putting together a comprehensive budget for your family to help make an educated decision on what payment you can afford. Are You Ready to Stay Put? Another factor when determining if you are ready to buy a house is simply if you are ready to settle down. When renting you have the flexibility to easily move at the termination of your lease. However, when you own a home you will either need to sell the home or convert it to a rental property if you want to move. When you sell a house you get hit with the 5-6% in realtor’s commissions as well, so if you haven’t lived in the home long and didn’t put a lot of money down then there could be a chance you’d walk away with nothing (or potentially even owe money at closing). In general, you should plan on living in the home for around 4-5 years. Are You Ready for the Unexpected Costs? The final factor when determining if you are ready to buy a house, is thinking about the maintenance involved with homeownership. If something goes wrong when you rent a home, you simply call the landlord to fix the issue. However, when you own the house you are the person responsible for all maintenance and repairs. While on the surface it may not seem like a lot of money, things like replacing a roof, fixing foundation issues or replacing a furnace or AC can be very costly. If you’re a handy person you may be able to handle all of this yourself. However, if you’re like most people and don’t know how to fix much on your own, then you want to be prepared and have an emergency fund in place. The average homeowner often gets in a bind when home repairs pop up because they didn’t plan for them. Most Americans end up putting these costs onto credit cards which can affect your ability to pay your mortgage and other bills. So, Are You Ready to Buy a Home? If you answer yes to all the below questions above, then chances are good that you’re likely ready to buy a house! Have you been pre-approved by a lender that has reviewed your credit, assets and income? Do you have a down payment saved up that you are comfortable putting down on a home? Is the proposed housing payment something you’re comfortable spending on monthly basis? Is the place you are looking to buy where you want to settle down? Are you financially and mentally prepared to deal with the repairs and maintenance associated with owning a home? 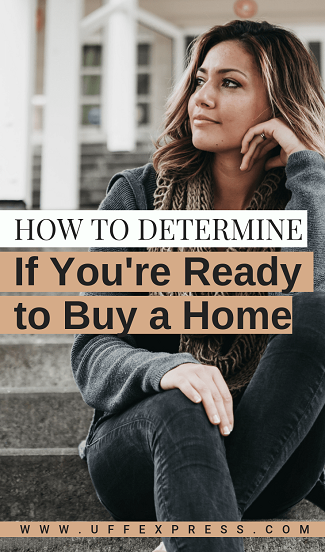 Buying a home is the biggest financial decision most people will make in their life and ultimately you are the only person that can decide if you are ready or not. Just make sure to be prepared and make the best decision that fits you and your family’s needs.